Sometimes we let hours go by between meals and we find ourselves starving. This then causes us to get a big plate of food which we likely should not finish. According to the Dietary Guidelines of America, a 2000 calorie diet is recommended for moderately active women between ages 21-50. Serving sizes are relatively small. For example, a serving of chicken breast (protein) should be the size of a deck of cards. A serving of the grain group includes 1 slice of whole grain bread, half cup of rice or oatmeal. 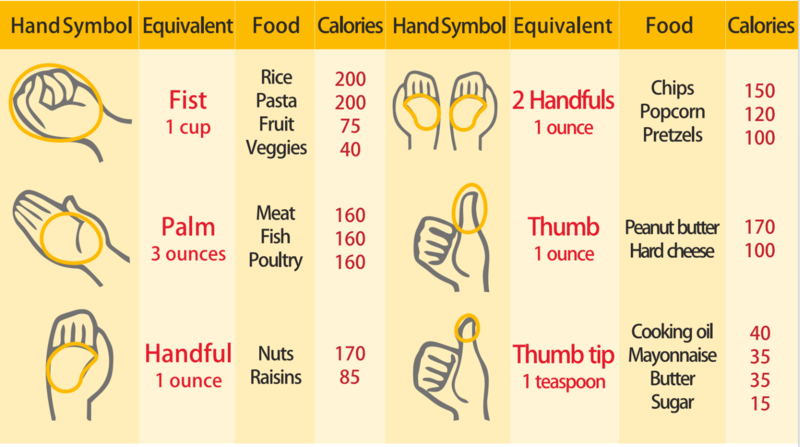 See the chart above for more portion sizes. Daily calorie intake depends on factors like gender, current weight, height, age and activity level. If you are looking to lose weight you’ll need to create a calorie deficit and become more active so you can burn even more calories during the day. As an exercise, it can be a good idea to write a log of everything you eat and drink, then count the calories. It will be a huge learning and eye-opening experience! You’ll see how much you really eat versus how much you should be eating to lose or maintain weight. You will quickly learn to pay attention to food labels! You’ll gradually learn portion control. There is also a variety of food logging apps for your phone which make it super easy to keep a food journal and track your progress over time. You don’t want to feel full at the end of every meal, you want to feel satisfied. 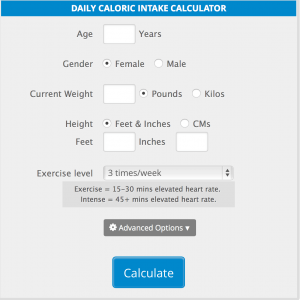 Try to log your calorie intake each day for two weeks. This will be an eye opening experience that can reveal the shortfalls of your nutritional regimen. Be mindful of the amount you serve yourself. Share a dish at a restaurant. Ask your waiter for an “appetizer” or “lunch” portion of a healthy dish. At home, measure your serving sizes with measuring cups. Carry around a 1-cup measuring cup in your purse, then glance at it for reference when serving yourself meals.